The answer is yes, and no. They overlap quite a bit, and while the number of anomalies are few, they are so distinctly different, that the terms are more dissimilar than at first glance. In its simplest form, to redevelop, is to develop again, which implies doing it over completely. While regeneration most directly means “rebirth or renewal” of something, implying that the entity remains throughout the process. In my experience these simple definitions distinctly describe the difference in the urban planning context. 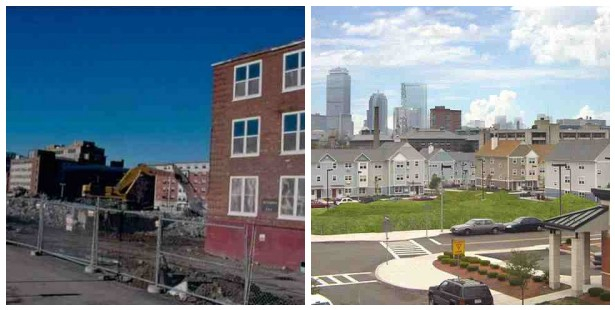 The American Planning Association (APA) defines redevelopment as “one or more public actions that are undertaken to stimulate activity when the private market is not providing sufficient capital and economic activity to achieve the desired level of improvement. This public action usually involves one or more measures such as direct public investment, capital improvements, enhanced public services, technical assistance, promotion, tax benefits, and other stimuli including planning initiatives such as rezoning. 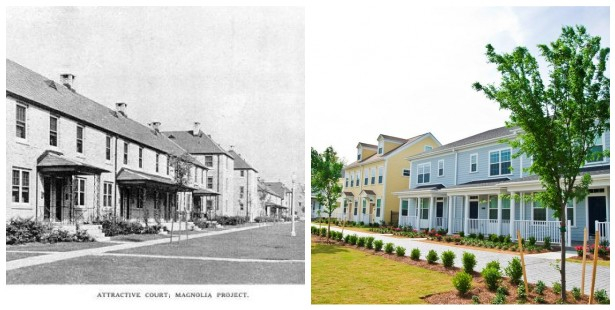 The slight difference in definition is that redevelopment focuses on monetary investment and physical changes. Regeneration focuses on the existing community and “social decline” of a place, equally with the economic and physical factors. It even goes further to say that it addresses “holistically,” “individual needs.” Of course there are many redevelopment projects that do address the community, but because the APA distinctly says that “the private sector may initiate redevelopment projects without any active public involvement beyond the government’s traditional regulatory role,” I would argue that it is not enough to measure against the social investment of regeneration. Perhaps the distinct difference in the responsibility to act directly on behalf of existing residents versus the primary goal of monetary investment is that England’s planning system is much larger and more politicized (and therefore receives more federal funding.) Of course, this comes with its own hindrances, but in this case social decline being put on equal footing is well worth what some call the overreaching arm of the government. While in America, gentrification might be seen as an inevitable and therefore an accepted side effect of redevelopment, in England, I would argue it is seen as sometimes inevitable and therefore tragic side effect of regeneration. To illustrate this point, let me give you an example of the power behind a true regeneration project: Angell Town in Brixton, London. 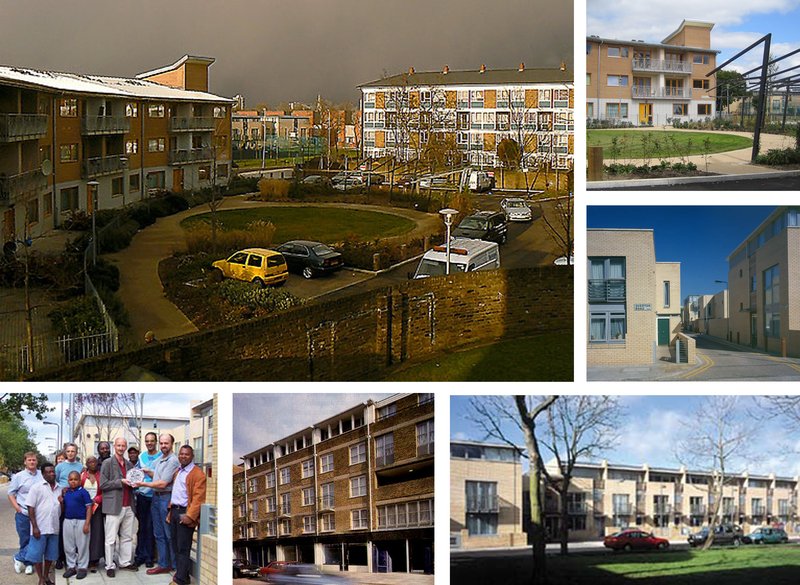 The urban design and physical improvements made at Angell Town Estate. Lack of public space for social interaction – derelict communal areas were unused. The garages provided were dark and unsurveyed, and therefore, never used. The estate was perceived as crime ridden as the multiplicity of bridges and walkways provided ideal escape routes for criminals, often from outside the estate itself. The estate became stigmatized a sink estate. The first main part of the scheme involved re-orientating the existing deck-access housing into a more “normal” street format, based on terraced dwellings which related to the street through individual entrances. Terraced housing replaced the monotonous, unsafe corridors of entrances. The pedways, which were perceived as unsafe, were removed so that the houses could be extended to face on to the street. New central grassed areas were defined as focal points for the houses. These areas were separated from the new vehicular perimeter roads by railings, enabling children to play, away from the danger of traffic and dogs. The un-used garages on the ground floors were replaced with shops and community facilities, such as a bar, cafe, workshops, and even a recording studio in one area – to provide the previously, much lacked social amenities. This design measure also helped transform dark and bleak spots into animated facades of street level activity. Instead of looking at this place, and only seeing its problems, the urban designer, planners, and architects looked at them as opportunities to build on the strong community that had lived there for decades. The project improvements didn’t eradicate every trace of the place that had become their home, but committed a large investment to renovate the buildings they could and design the new ones to complimented the existing so well you had to look hard to tell the difference between the two. Members of the community could still look and see where they came from, in other words, it still felt like home, but most importantly they could look again a little harder and see their bright future. This might sound like I’m laying it on a little thick, but the success of this regeneration stunned so many nationwide, and contental-wide, that intense project documentation occurred, including resident interviews. The members of the community realized what so many times planners don’t: they looked to their physical environment to define their identity. With the existing bones of the original Angell Town Estate still in existence, they easily correlated the physical improvements to be improvements in themselves. This outstanding result came from an intense and time-consuming community consultation process (another distinctly different term than public involvement). The lead urban designer was so involved with the community that he actually lived there are the weekends in a flat. While this is rare in either country, it certainly is to be commended. Perhaps the most powerful item in Angell Town now are the benches that poetically are made from the rubble from the demoed parts of the old buildings, caged, with a stone seat atop them. People can actually sit on the physical representation of what was destroying their community: a poorly designed public realm. This was recited by residents often as what made the biggest difference to them. Don’t ever underestimate the power of poeticism. Caged rubble representing moving forward to a healthy and safe community. So, what will it be redevelopment or regeneration?